In today’s world, manual paperwork has become antiquated and anachronistic. Everyday people conduct their lives and conduct their business without paper. Self- service is rapidly becoming the expectation of people in every facet of life. Many progressive healthcare providers have seen the need to use technology as a tool for their patients in order to make the system and process easier to navigate and less redundant. 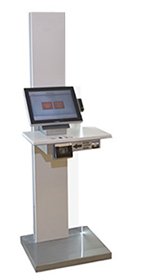 Clearwave Corporation’s self-service registration makes use of the kiosk as the cornerstone of self-service registration. At the kiosk, patients review their own information, make updates as needed, scan insurance cards/drivers licenses and remit payment. It is a true self- service experience that automates registration, validates insurance and ensures accurate updating of patient information. Most importantly it eliminates the use of the dreaded clipboard with multiple pages of already requested information from the patient. The kiosk based patient check-in eliminates registration bottlenecks, provides patients with an express check-in option, allows medical providers to increase point of service collections and, reduce administrative costs associated with front desk operations and back office collections. Clearwave’s ability to verify insurance and demographic data at the time of schedule and point of service is a necessary front-end of any Revenue Cycle process. To complement this streamlined registration process, the Clearwave system also provides patients with an estimate of their portion of the bill. Healthcare providers can now easily generate written estimates of anticipated charges and projected payment for services within a patient’s health plan. By providing more transparent pricing for medical services, this approach benefits all parties involved. Clearwave Corporation, headquartered in Atlanta, GA., is the leading provider of self-service kiosk registration and eligibility verification solutions. Clearwave’s solution automates eligibility verification and greatly reduces the time patients spend checking in and sitting in the waiting room. Patient satisfaction improves as lines; paper forms and redundant questions are eliminated and replaced with the convenience of a rapid self- service check-in.